Whenever I got gloomy about the rain in Vancouver, this was my friend’s favorite way of snapping me out of it. He was right; there are very few places where you have glorious mountains in such close proximity to beautiful beaches. Naturally, since there are so many different ways for women to get out and get active in and around the city, Vancouver makes for a great destination for those seeking an activity-based girls getaway. The areas surrounding Vancouver also host some adrenaline-pumping activities, like whitewater rafting in Chilliwack, bungee jumping in Whistler, kiteboarding in Squamish, and hiking the Stawamus Chief in Squamish, you don’t have to venture out of the city to find some great activities. You’ll be amazed at what kinds of urban activities await. With more than a few sparkling waterways, Vancouver is an excellent place to go kayaking. If you don’t have access to a car, your best bet is to head to one of the three Ecomarine Ocean Kayak Centre locations – English Bay, Jericho Beach, and Granville Island, and pick up some rentals. Two hours in a single kayak will cost about $40, while two hours in a double is $50, so figure out what’s more cost (and energy) effective, and head on out into English Bay. These centers also rent stand-up paddle boards, which, if you’re looking to seriously work those abs, could be just what you girls are looking for. A one-hour rental costs about $30, and is only available from the GI and English Bay locations. If you have access to a car, take the extra time to drive up to Deep Cove, in the northeast corner of North Vancouver. Deep Cove is a gorgeous little community, beautifully situated at the bottom of Indian Arm, a popular waterway for cruises, kayaking, and camping. Deep Cove Canoe & Kayak are the outfitters you want to see. They’ll hook you up with kayaks and stand-up paddle boards, and give you pointers on how far up the arm you can go, given your rental time. On the other side of Indian Arm is Belcarra Park and Jug Island, which are really pretty little places to visit if you’re only going out for a couple hours. Rental prices here on the weekends are about the same as they are in the city, but if you can come midweek you will save a little bit. Either way, kayaking and stand-up paddling are two Vancouver favorites when it comes to getting out and getting active. Vancouver and its surroundings are full of provincial parks and hiking trails. Not far from Deep Cove is Lynn Canyon Park, which is home to a free suspension bridge, as well as the Twin Falls Trail, the Lynn Headwaters, and the 30-foot pool. The Baden Powell Trail also runs through the park. 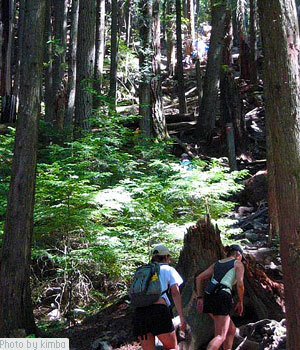 Another popular north shore hike is the excruciatingly demanding Grouse Grind. You’re probably wondering why on earth I would suggest doing a hike that I deem “excruciatingly demanding”. Not quite. Since Vancouver is full of fitness aficionados, they’re constantly using the outdoors to stay active. Thus, it’s only natural that they would scale the side of a mountain for fun. The Grouse Grind is a 2.9 kilometre trail up the side of Grouse Mountain, the middle of the north shore mountains. It’s gruelling, and commonly referred to as “Mother Nature’s Stairmaster”. Actually, it’s more than that. It takes female fitness whizzes anywhere from 45 minutes to an hour to complete. Normal people – aim for under two hours, depending on your fitness level. Why do it? Well you could pay $35 to catch the gondola up to the top of Grouse, or you could huff and puff and lament your way up on foot, be totally overwhelmed by the view, feel ridiculously proud of yourself, and then only pay $5 to grab the gondola down (it’s highly recommended you don’t walk down… you’ll understand why once you get to the top half of the trail). And hey, you can say you climbed a mountain… because you did. The manmade seawall is a 22 kilometre walking, inline-skating, cycling, and running path that circles the water around Vancouver. Most Vancouverites flock to the seawall to pound the pavement, and one of the nicest ways to experience the seawall is by bike. If you’ve got time, cycle the whole thing, if not, prioritize the Stanley Park section, which takes about an hour. Bike rental stores are clustered near the entrances and exits of Stanley Park, so as long as you’re on Denman Street, you should find a rental place easily. One of the most popular is Spokes, at the corner of Denman and West Georgia, and it’s perfectly situated for Stanley Park bike excursions. The price of rentals varies based on length of time and style of bike, but expect to pay between $20 and $40 per person for a half-day (6 hours). Spokes offers different styles of bikes, depending on what your needs are. 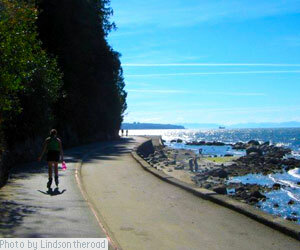 Stanley Park is not only home to the seawall, but to a network of trails as well. Spokes can rent trail bikes as well as cruising and city bikes, should you wish to get off the seawall and explore the inner workings of Stanley Park’s trail system. Regardless of how you choose to cycle in Vancouver, I vote that you make a quick pit stop at a nearby market – Granville Island will do nicely – and stock up on picnic items. Stanley Park has an endless supply of nice patches of grass, perfect for picnics and chilling out. Who says that active girls don’t want their downtime too?! Pingback: The Last Minute Vancouver Foodie Guide « Near. Afar.